36,000 lbs and 12′ wide. A fabrication shop is not complete without metal forming capability. 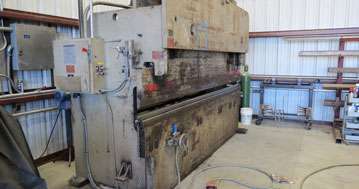 The press brake adds a new level of professionalism to fabrication projects. Projects that were traditionally cut and welded to form corners and bends now are bent. Bent or formed corners are much stronger as well as better looking. My father bought it brand new in 1981 and it remained in service at BearCat Mfg. until it was replaced in 2015. We moved it to my shop in hillside and is still the center of most projects.